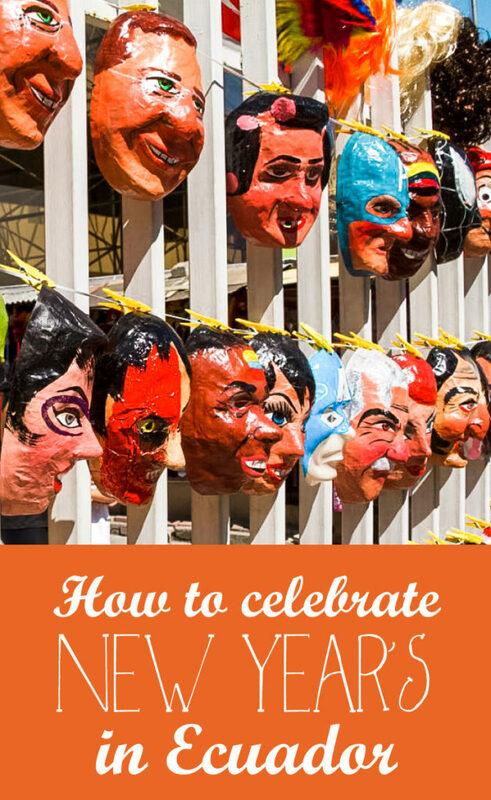 In Ecuador, New Year’s is not called New Years. It is called Año Viejo (old year.) 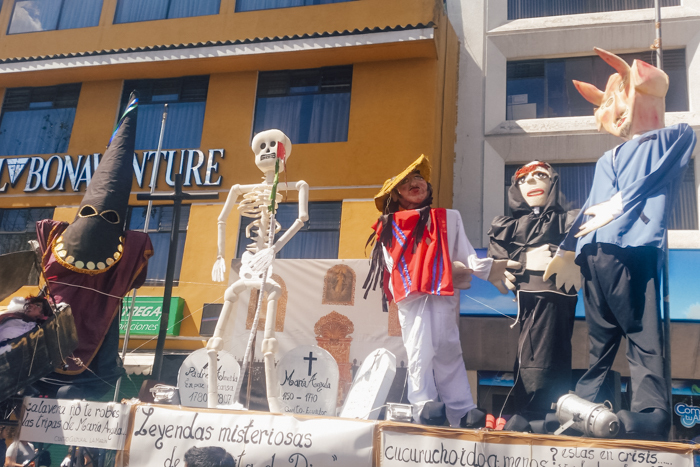 Año Viejo is celebrated all over Ecuador, but it is slightly different from the coast to the highlands. The celebration starts early 31st of December and lasts until the new year. 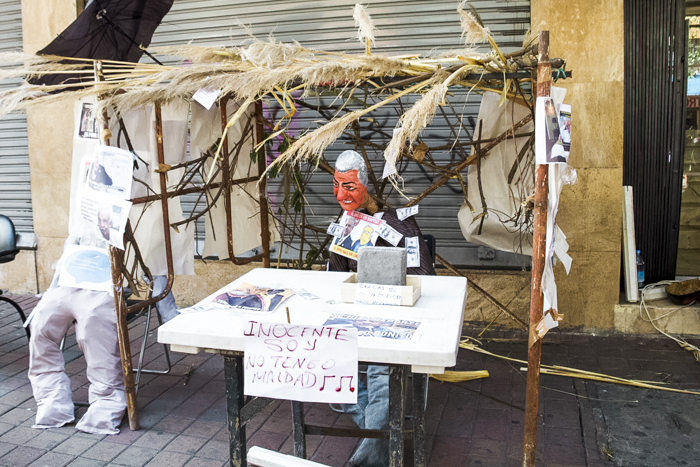 Weeks before the Año Viejo, you can buy the Año Viejo puppets that you burn at midnight on New Year’s Eve. Burning the Año Viejo is a symbol of moving on and that you are done with the old year and have a fresh start in the new year. 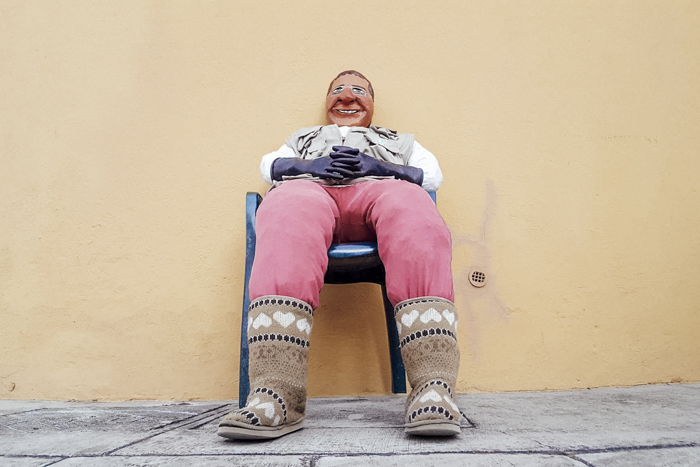 In the highlands, the puppet usually is an imitation of famous people like celebrities, politicians and public figures. On the coast, it is often a puppet of a cartoon from tv-series, movies or generally a famous figure. 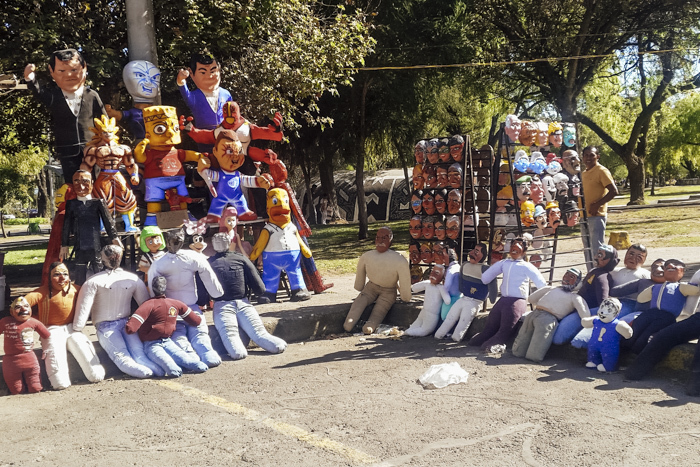 Sizes vary in the highlands and many people make their own puppet using own clothes and materials and fill it with newspaper. 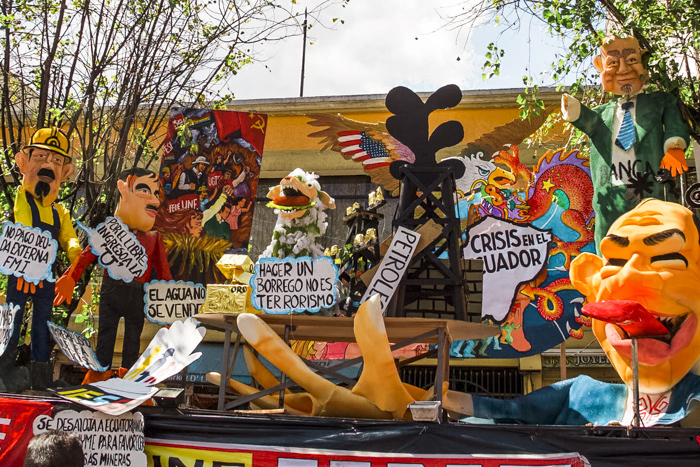 It is also common to jump over the Año Viejo puppet when it is on fire. That is supposed to mean good luck. 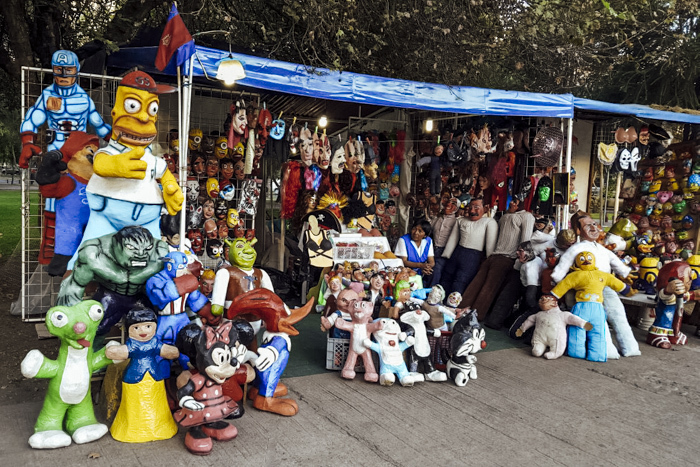 The puppets can be bought around parks and parking areas. The Año Viejos are usually huge on the coast where they usually display it like a statue. 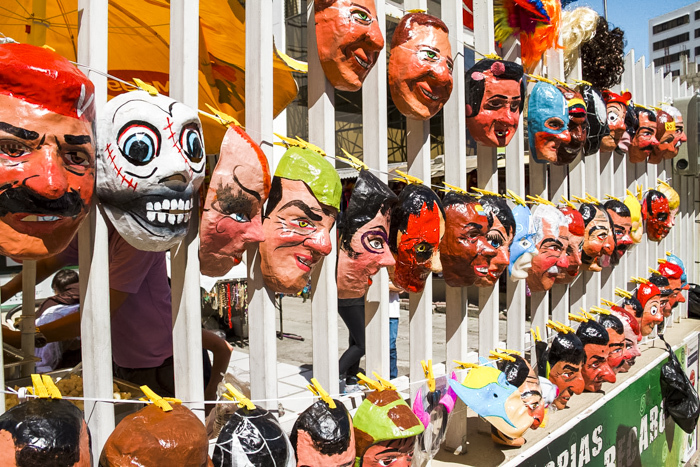 You can also buy masks to for the Año Viejo puppet. Be prepared for the need of lots of coins in your pocket if you are planning on driving in Ecuador on the 31st of December. It is a tradition in Ecuador for men to dress up as slutty widows and beg drivers for money. They will stop your car, drag you out of the car and eventually dance with you until you give them money. Another tradition is to run around your block with an empty suitcase. That means you will travel a lot in the coming year. 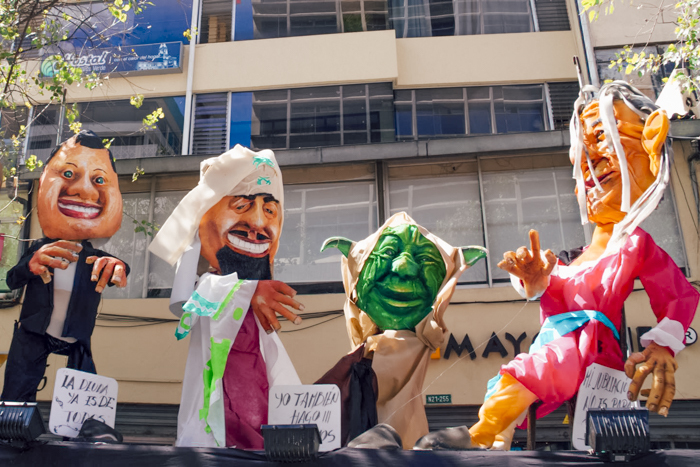 Throughout the whole day and night, in the streets Avenida Amazonas y Colon towards the south you will see installations of large Año Viejos that will burn at midnight. Many people decide to celebrate New Years in these streets. Are there any special New Years traditions where you live? Would you celebrate it in Ecuador? Those colorful puppets have such cheerful faces. You really feel that there’s taking place a big celebration. 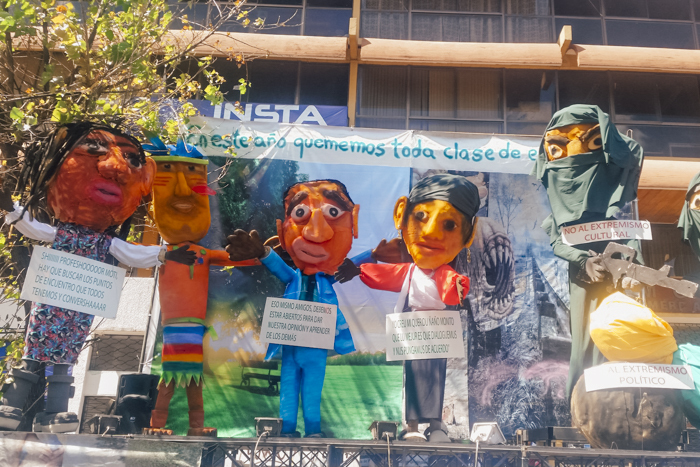 I think it’s a great experience to be in Ecuador for New Year and dance, photo, eat with those puppets. I know that this is going to sound crazy, but I have an odd puppet/doll phobia! So this sounds a bit like a nightmare for me. Haha. I wish that I didn’t because this sounds like a very funky celebration! So that is a bit bizarre – especially the slutty widows bit!! The burning of the puppets is a bit like Guy Fawkes night in England, we make big puppets or ‘guys’ and put them on the bonfire. I don’t think we would jump over them though, we’re a bit too health and safety conscious!! Wow, this is truly a great idea. I actually have been planning to celebrate my new year outside of my humble country, but always didn’t able to make it. With this blog post of yours, will surely push it and finally it will happen next year. Ecuador might be one of the countries I should consider spending my New year with. Thank you so much for sharing this with us. Reading your post and looking at the pictures, I am tempted to head towards Ecuador to celebrate Ano Viejo! The puppets look so intriguing and colourful, straight out of a children’s fairy tale or comics book. The practice of men dressing up as widows sounds really fascinating. I would love to go to Ecuador and celebrate New Year’s eve (Año Viejo), it looks and sounds like such a fun and colourful experience. Though saying that those puppets little a little scary for me however very cool at the same time. 🙂 I had to reread it twice when I read that men dressing up as widows sounds stranger but funny.